Yup, culture definitely wasn’t coarse in 1831. The twin horrors of Ferguson and James Foley have been bombarding me this week, and each has offered plenty of opportunities for observers to complain about the “coarsening of culture.” Predictably enough, right-wing commentators have attributed both Michael Brown’s death and the resulting unrest in Ferguson to a “coarsening of the culture,” an absurd attempt to blame the victim akin to blaming school shootings on video games. Less predictably, I caught Bobby Ghosh (who I think is great otherwise) attributing the wide circulation of the James Foley beheading video to “a coarsening of culture” on WHYY’s Radio Times. Getting it from all sides like this makes me want to weigh in, because the “coarsening of culture” narrative is a particular pet peeve of mine. The real sin that the absence of a historical sense encourages is presentism, in the sense of exaggerating our present problems out of all proportion to those that have previously existed. It lies in believing that things are much worse than they have ever been—and, thus, than they really are—or are uniquely threatening rather than familiarly difficult. Each historical moment is unique, but it is rarely unprecedented. It is the hubris of the historically ignorant to think that somehow we alone face challenges unlike any ever seen before. And this is precisely the problem with the “coarsening of the culture” argument. It presumes that somehow culture was more refined in the past, and that it’s somehow “coarser” now. It implies that “cultural coarseness” is some sort of objective constant that can be measured in different moments, like temperature. And it implicitly suggests that we in the contemporary moment face unique challenges from this “coarseness,” something that our ancestors did not have to deal with, and maybe could not even foresee. I don’t know about you, but that seems pretty egotistical to me. See the example of the image above, which I have recycled from my last blog post, because it seems equally relevant. 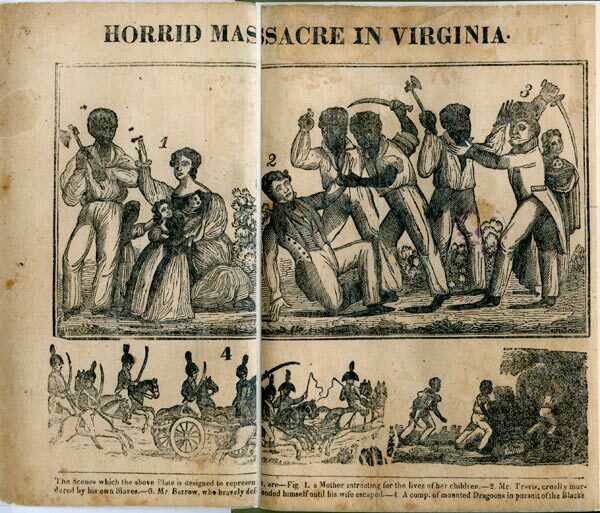 It’s a woodcut of Nat Turner’s Rebellion in 1831, an event that certainly shocked contemporaries with its coarseness. 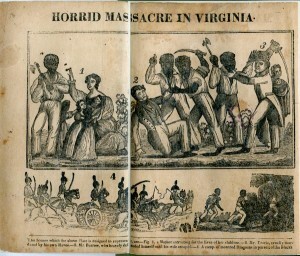 And this image portrays the violence in pretty stark, unforgiving terms. Maybe it’s not a video of a beheading, but given the available technologies for mechanical reproduction in 1831, it’s a pretty in-your-face, and dare I say coarse rendering of the slaughter in Southampton County. The current unrest in Ferguson and Iraq can tell us a lot of things about our contemporary moment, but the “coarsening of our culture” isn’t one of them. Great post. I’ve put a link to it from my most recent post on “The Speculative Fiction of William Gosline” looking at satire and irony… or the death thereof!